To be a successful dental practice you must have an up-to-date website that educates current clients and intrigues and attracts new clients. If you are not working with a top dental SEO company to ensure that in the search engines your website ranks well, you are more than likely losing business to your competitors. A lot of dental practices are wondering how to differentiate an enthusiastic dental SEO expert compared to the myriads of SEO companies who just cold email you. Complete Dental Marketing would not be who we are if it wasn't for a vast knowledge of SEO work. We make it easier for you to know that we are the most dependable SEO team. We are highly skilled and reputable especially when it comes to SEO specifically for dental practices. What truly sets us apart from other SEO companies is that we explain the SEO strategies and our process so you know what is going on from the beginning. Most dental practices are frustrated with the lack of cogent, clear and actionable information on how SEO companies actually gain new patients from SEO, leaving most of them feeling forced in the hopes that the company may succeed. Complete Dental Company is one of the few that take the time to help explain our process of success and how we are going to create new patients and keep existing ones through SEO. We show you why it will work and how we adapt to competitive variables. Dental SEO, Search Engine Optimization, is a marketing technique used online that focuses on directing non-paid or organic traffic to your website by having the website rank high on a search engine results pages for popular phrases and keywords made relevant by the website owner. Today’s most common search engines like; Google, Yahoo!, and Bing, show a list of specific search results. Those specific results are ranked. It is based on what the certain search engine deems relevant to the interest of its users also known as your patients or future patients. Most search engines do not charge a fee for SEO, which is why it is important to take full advantage of it for your practice. We are SEO specialist that create content with keywords that are relevant to your target audience. 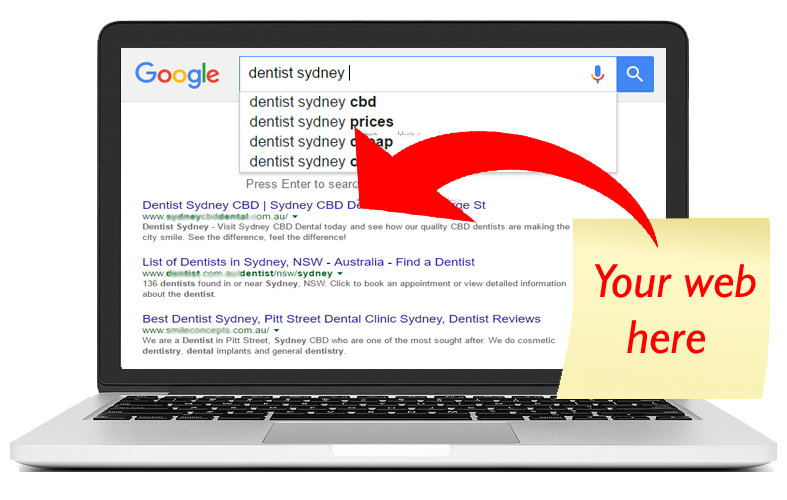 We fully understand that the more relevant the keywords, the better chance of your dental practice's website appearing near or at the top of that search engines top results. This will be any practices first step toward getting their practice noticed by prospective patients using the internet to find a dentist close to them. ​SEO is an effective, valuable and efficient way to connect with always increasing the number of patients online searching for a dental practice. It is important to understand that every business including, dental practices, has a specific target niche. After understanding that target niche we then can use online marketing to make it simpler and faster to make contact with the patients searching for that business’ service or product. Learning about dental marketing can dramatically help any practices reach, and one of the most important components of effective dental marketing is SEO. SEO is what truly connects you the fastest, it exposes you the right people. The best comprehensive dental marketing campaigns that include the use of proper SEO will directly lead people searching for your service, products or any dental-related content to your website. It not only gets you connected to people already looking but allows your practice to reach a bigger and broader audience. While going through the process of understanding how Complete Dental Marketing can help your businesses SEO you also start to get a better look at your audience. If you know the preferences, top searched keywords for dental practices, you can then adjust what you’re offering to be in better alignment with what is truly desired by the audience you are trying to connect with. Lastly, dental practice SEO is important because it helps you see what your competition is doing both bad and good. It is smart to be regularly monitoring the practices that are constantly appearing in the top results. You see what is bringing in target audience as well as what can push them away. Complete Dental Marketing takes a pellucid and organic approach to our SEO services specifically for dental practices. Our SEO services help your dental practice potential patients find your website when searching online. We supply a range of measurable tasks and specific deliverables. Our prices are published so you can see the truly genuine value we provide for your investment. We have our rates, processes, and services that are included in our Professional Dental SEO Packages. Organic SEO, organic search engine optimization, refers the methods or techniques used to provide a high ranking (or placement) on a search engine results page in algorithm-driven results that are unpaid on the specific search engine. It easy to gain a bigger patient base because people use search engines more than ever to get better information about the services that they are interested in purchasing. Consumers will go to search engines before doing business with a large national company, and they will also make effective use of search engines when planning to make local purchases or commitment like becoming a new dental patient. Getting to the top of the search results of top search engines takes the hard work and solid SEO strategy we proudly produce. When this is done correctly, organic search engine optimization can help your dental practice attract more leads, sales, and patients, which results in more revenue. The truth of the matter is that for dentists SEO is what works to become more successful. It has even been read in Forbes that as long as you tune in on optimal user experience while using methodic SEO strategies, you will secure organic traffic and higher positioning for your site, including your dental practice. It is time to advance your company just like how technology has advanced and the only way to truly do that is through Organic SEO. Serving all 50 states for Dental marketing including Alabama, Alaska, Arizona, Arkansas, California, Colorado, Connecticut, Delaware, Florida, Georgia, Hawaii, Idaho, Illinois, Indiana, Iowa, Kansas, Kentucky, Louisiana, Maine, Maryland, Massachusetts, Michigan, Minnesota, Mississippi, Missouri, Montana, Nebraska, Nevada, New Hampshire, New Jersey, New Mexico, New York, North Carolina, North Dakota, Ohio, Oklahoma, Oregon, Pennsylvania, Rhode Island, South Carolina, South Dakota, Tennessee, Texas, Utah, Vermont, Virginia, Washington, West Virginia, Wisconsin, and Wyoming.